On our site, you will find the remaining inventory of our old stock of pins & brooches, manufactured exclusively by Jonette Jewelry Company in the USA. Most pieces listed are the last ones available. All pins are "new vintage" - never worn and stored since the date of manufacture. They are in very good to excellent condition, with the exception of some brass items that have antiqued with age, as described. Please read our Order FAQs for additional information. In the last few years there have been some reissued designs that have entered the marketplace, commonly found on ebay. While they may be stamped with the copyright JJ mark, they are recently manufactured items. The Jonette Jewelry Co. ended production in September, 2006, after 62 years in operation as a family owned private company. 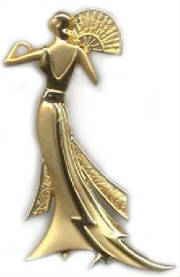 Original pins manufactured by Jonette Jewelry are highly collectible, and getting much harder to find.